What to do with a couple of hours to spare on a beautifully sunny afternoon……………. Popped down to Laide Beach for a little wander whilst the tide was out. As you can see, photographing Rock Pool’s can get a little addictive. Why wait for Shrove Tuesday! Then later on in the afternoon we headed out to Mellon Udrigle to walk the circular route around the headland. To the west Opinan was basking in the lovely warm sunshine . And there were lovely views over to Lochinver & Stoer Lighthouse (if you have exceptional eyesight you can just about see a little white dot on the headland at the far left of the photo!). to the east the dark skies loomed. An Teallach, Sail Mhor, Beinn Ghobhlach, Suilven & The Coigachs were all dark & moody under the heavy clouds. The rain did the right thing & stayed over the mountains & out to sea. There has been a marine survey boat in the area for the last couple of days. As we were watching it patrol the water the Calmac ferry from Stornoway headed towards Ullapool. Just as we were heading home the coastguard/mountain rescue helicopter flew over on it’s way towards Lochinver – Hope no-one has been caught out on the hills with the changeable weather. It may have been a day of sunshine & showers yesterday but at 9.45pm the setting sun over Gruinard Bay was a stunner. The sea was incredibly still & almost melted into the sky. The Summer Isles & the Lochinver Hills look very serene. but as you can see the picturesque scene was photo bombed by a pair of mallards. Not that we’re complaining it’s only fair to share the great views. Sail Mhor & An Teallach glowing in the sunset. Wonder if the wild mountain goats are enjoying the sunset from the summits. Well the B&B bookings are coming in so less time with the camera more time baking sweet treats. Busy days on the North Coast 500 Route. What a glorious week it has been. The weather has been on top form & we have taken full advantage. The garden has kept us very busy over the last 4 days but we managed to find a little time here & there to relax in our beautiful surroundings. A couple of nights ago we took the hound for a walk to the cave in Laide which was pretty impressive as the sun was setting & the waves were crashing in. It wasn’t a particularly windy day but some of the waves were pretty big. Today we were up a tiny bit earlier than normal …… 4.45am!!!! for the Laide Wood Dawn Chorus Walk. The sunrise was a beauty and it was nice & mild for so early in the morning. There was plenty of birdsong happening in the wood with Chaffinch & Wren competing for the most heard. Redpolls were whizzing over the tree tops on a regular basis. The next sighting wasn’t of the bird kind but still interesting if you’re into mammal droppings!!!!! The resident Pine Marten had left a little present on the path!!!!! We heard a Mistle Thrush singing away in the distance and managed to spot him (or her) on top of a very tall Pine Tree. We saw the nest site of a Woodpecker & later spotted it flying quite low sounding a little alarm call. Then as we were nearing the car park we heard the high pitched trill of a Goldcrest and also a new sound to us which was the drumming of a Snipes tail feathers during display flight, it was something pretty unusual. And to finish with we heard a Skylark in the distance singing away. So all in all it was a very productive trip with lots going on and we must say thank you to the very knowledgeable Peter Cunningham who has quite an ear for birdsong. The hound thoroughly enjoyed playing on the beach with his tennis ball. Further along the beach we came across a couple of Oystercatchers, one was enjoying a good scratch but the other wasn’t too pleased with us being around!! Then it was time to visit Gruinard house. They had a Garden Open day today for members of the public to walk around & admire their beautiful gardens & vegetable plots. 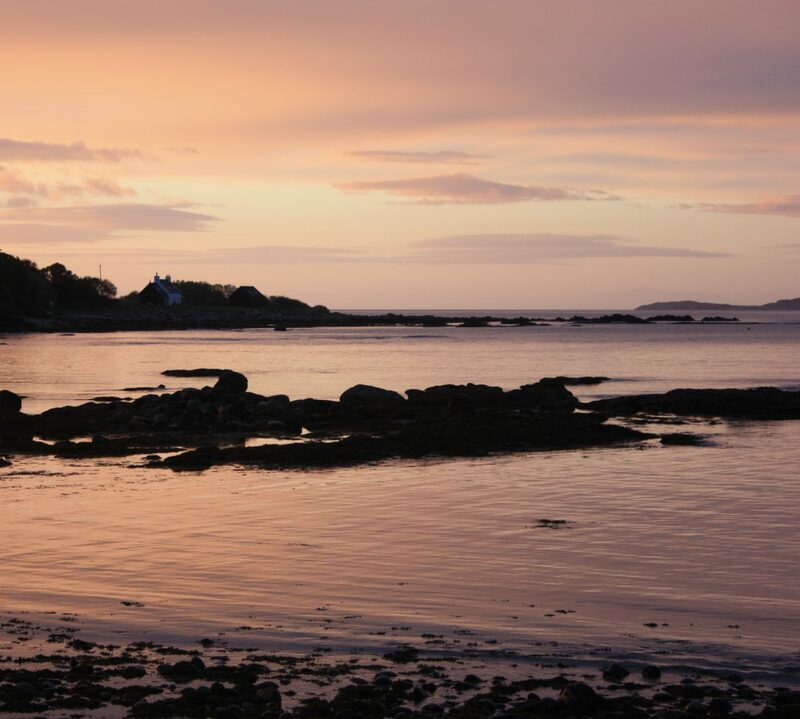 The house is located in a picturesque setting with Gruinard Bay & Gruinard Island in front of the house & the gardens overlooking the riverside. They had a book sale & a tea & cake afternoon with a share of the proceeds going to Gairloch Heritage Museum. Well we have been up now for around 19 hours so it’s definitely time for bed! The BIRDS!!!!! don’t worry not the scary hitchcock type. Well today has been a twitchers delight. The sun has had his hat on & the birds have been enjoying every minute. We started the morning with ringed plover feeding on Laide beach and a small group of Dunlin feeding right on the waters edge whilst trying to avoid the waves. Throughout the day the Swallows have been putting on quite a display feeding & chasing one another. They even managed to pose for a couple of pictures. By early evening a couple of Siskins came to have a nibble on some nearby trees & Wheatear popped by but didn’t stay long. So all in all we’ve seen a fair few birds only a matter of metres from the house. Today there was a special visitor to Loch Ewe, the Hebridean Princess Luxury cruise ship was anchored in Loch Ewe overlooking Inverewe Gardens and Poolewe. We had a little nosey on the website for the Hebridean Princess and wow they’re not kidding when they mean luxury!! The weather was a little on the bleak side but the dark skies soon blew over, I think they may have needed the breaks on the dinner tables though! The company who owns the ship is Hebridean Island Cruises who are based in Skipton of all places. Just a stones throw from where we used to live. According to Wikipedia HM Queen Elizabeth II has twice chartered the cruise ship for family holidays. Gairloch beach was yet another deserted beach today, apart from a few Oystercatchers & Mergansers oh and a Sea Potato!!!! We drove 5 minutes from the house this evening and took a walk on a deserted little beach overlooking Gruinard Bay. It’s a lovely spring evening with the sun setting over The Minch. The walk down to the beach from the parking area on the A832 passes the ruins of what looks like an old crofting village with stone sheep pens & possibly what looks to be old Lazybeds, we will have to find out a bit more about these ruins. We disturbed a couple of waders but had forgotten to bring the binoculars so we didn’t manage to see what they were. Must remember to leave a pair of binoculars in the car because you never know what you might see on your travels along the West coast of Scotland. We know that from time to time that otters have been seen on this beach. There was clear evidence of somebody having a barby recently and why wouldn’t you? On a clear, sunny day tucked away in the dunes with just yourselves and the wildlife for company.